Flan, how I love thee. Let me count the ways. 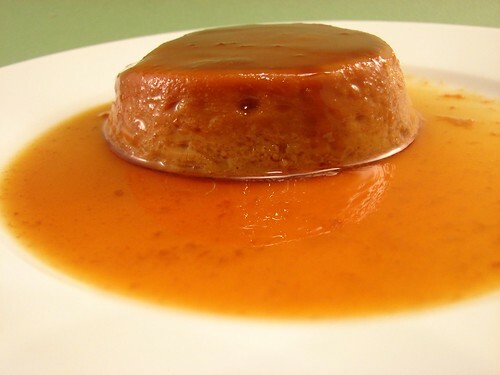 Flan de vainilla. Flan de coco. 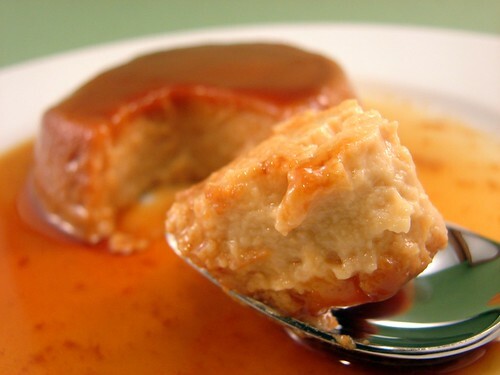 Flan de queso. Flan de chocolate. Flan de caramelo. Flan. Flan. Flan. Flan! The mere word brings a smile to my lips and conjures up childhood memories when Mom would whip up a batch of Flan Royal (the national brand). Yummy goodness. This is one of those really easy desserts that makes a BIG impression. I thought I would share my version of cheese flan with you. I like the custard to be smooth, but not terribly eggy. This recipe does just that. I also add almond extract and, when I have some in my bar, Amaretto. But I didn’t this time, so there isn’t any in this. Still, it was so yummy! 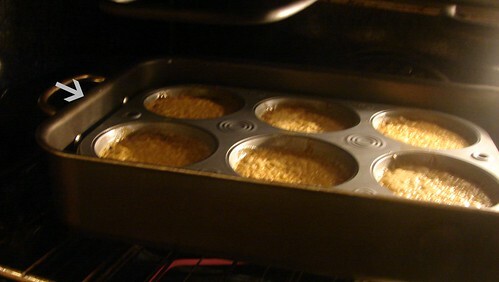 On this occasion I cooked them in a large muffin pan because I wanted to present them individually. However, I usually bake it in a 9-inch baking container and slice it. You can do it either way, of course the baking time will vary slightly. Preheat oven to 350°. 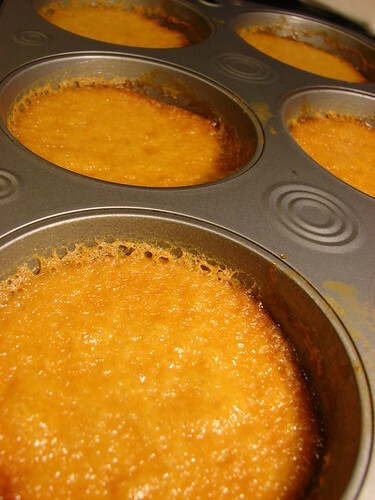 Prepare a Bain-Marie: you will need a baking pan that is large enough to hold the dish you’re baking the flan in. Add hot water to the large pan and place in the oven. 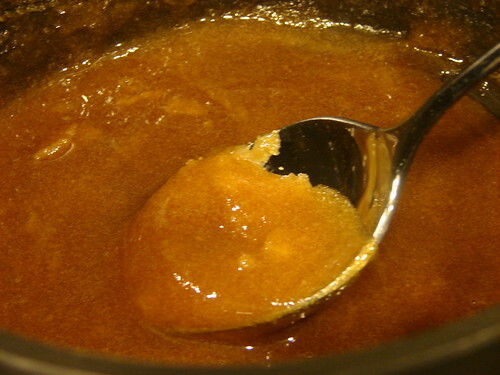 Make the caramel: add the sugar to a medium, heavy-bottomed pan and put it over medium high heat. 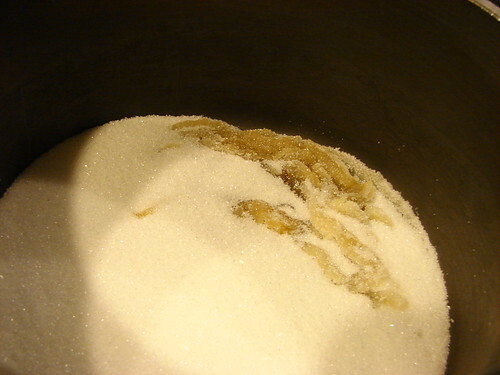 Once the sugar begins to melt, lower the temperature to 1 or 2 notches. At this point, turn down the temperature 1 or 2 notches, you want the sugar to dissolve, but not burn. Burnt caramel is no bueno. 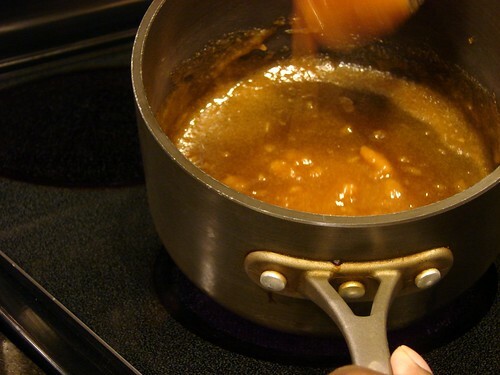 Make sure all the lumps created when stirring have dissolved before you add the caramel to the baking dish(es). Be VERY careful with this sugar. I don’t think I’ve had a burn more painful than that of a caramel burn. Don’t multi-task here. When you have smooth, dark caramel, pour into the dish and swirl it around to coat as much of the cooking surface as possible. Set aside and allow it to cool. 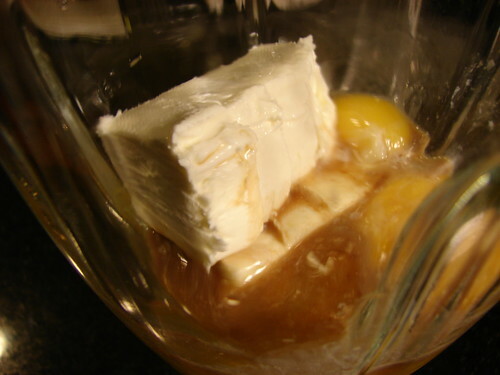 It is best for the caramel to cool completely before adding the flan mixture–but DON’T refrigerate it to accelerate the cooling process or you’ll end up with cracked caramel and the custard will seep through it. Making the custard: Put all the ingredients except for the milk and brown sugar in a blender glass and whisk until smooth. To avoid foaming the eggs, do this by pulsating instead of letting the blender go for a long time. It shouldn’t take more than 5-6 pulses. In the meantime, use the same saucepan you made caramel to scald the milk. There will probably be some caramel stuck to the pot. That’s fine, just add the milk and brown sugar and simmer until you see bubbles beginning to form around the edges. Turn off and remove from the heat. You will now incorporate the hot milk into the egg mixture, because the milk is pretty hot, start the blender on low and slowly drizzle in the milk/sugar mix. As soon as all the milk is added, turn off the blender. Pour the custard into the carameled baking dish. Place the dish with the custard into the pan with water. The muffin-sized flan baked for 25 minutes, if you bake it in a 9-inch dish, it will probably be in the oven for close to 45 minutes. You’ll know it is ready when the top is golden and it begins to separate from the sides. Remove from the oven and allow it to cool at room temperature for about 30 minutes, then put it in the fridge to cool it all the way through. When you’re ready to serve, run a table knife around the edge to help loosen the cooled flan. Then invert it onto your serving dish. To serve the individual ones, I loosened the target cup and placed plastic wrap and foil over the ones to keep them in place. Make sure you invert over your sink, you’ll be amazed at how much of that caramel melts away onto your serving dish. Make sure to serve it chilled and… ENJOY! *Note: If you are not an almond flavor lover, you can skip the almond extract and increase the vanilla to 1 tsp. Arlene, Ann, Jenn... Thanks so much guys! It was a happy day for sure, glad I could share it with you. Oh, yum! This looks great. I always thought there was some sort of specialized "flan" dish you had to bake this in. Good to know I can just use a muffin tin. :) Thanks! Woman, stop posting pictures like that! I just gained 10 lbs. just by looking at your flan's photo! I tried making flan twice, I just can't seem to get the texture right. This is a pretty popular dessert here in the Philippines too. I know what you mean about the texture, I've had 'episodes' with flan too. I do think that baking them in smaller dishes minimizes that problem. Also, the water bath and low baking temp are a must! I am definitely going to try this! I love the fact that it's not too eggy (lots of them are, and I don't like the egg taste). Your pictures are beautiful. Flan is superb, and with cream cheese, that's just over the top delicious! Oh, this looks super-NOM. You are so prolific, it's awesome! Great recipe - I lived in PR for a while and this recipe is very close to what many restaurants used. My only suggestion would be to not bake the custard as long. The ones in the picture are slightly over-cooked - you can see the eggs have "scrambled" a bit. The flan should jiggle slightly in the center, and definitely not pull from the sides. Thats my two cents at least - looks tasty though!! !